Haandvo is my all time favorite. After mom would declare that she is making haandvo, i would keep hovering around kitchen, till the Haandvo would be done and i could lay my hand on this crispy, cruncy outside and the soft, soft and yummy, yummy inside delicacy!!! The best thing about it is that apart from being amazingly tasty, it is also healthy and complete food with cereal, pulses and veggies, food can’t get better than this!!! All my neighbours (at Hyderabad and Noida) who tasted this at my home, loved it. My front door neighbour P learnt to make it from me and now makes her own Haandvo and gets Haandva no lot grinded!! 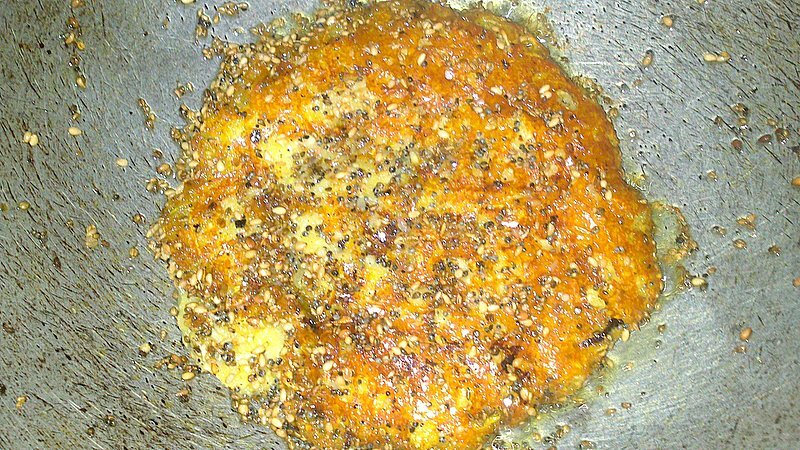 I make Haandvo in a Pan, this kind of haandvo is also known as “Dangeli”. You can also bake it in the oven. 2) Once it is fermented, add green chili, ginger, salt, turmeric powder, hing and grated bottle gourd. Mix well. Add water if needed, but remember Bottle gourd will also release water, so careful with it. 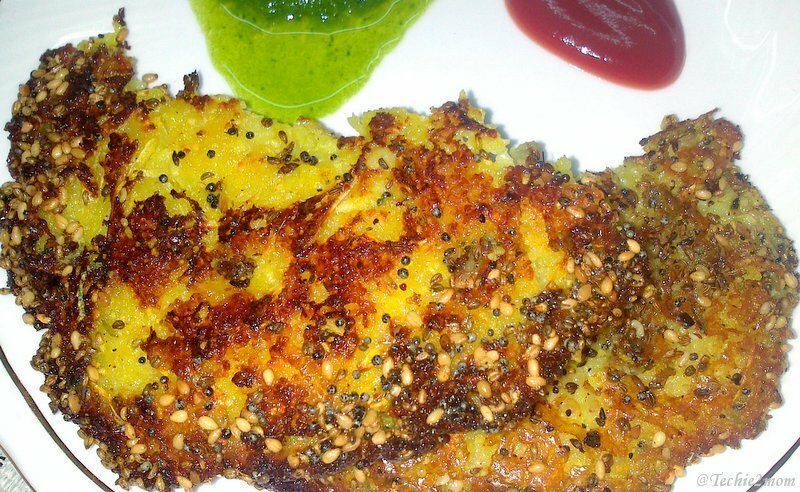 Batter Should be of the consistency of Idli. 3) In a Non-stick pan on low flame, take 3 tablespoon oil in it. 4) Add mustard seeds to it. 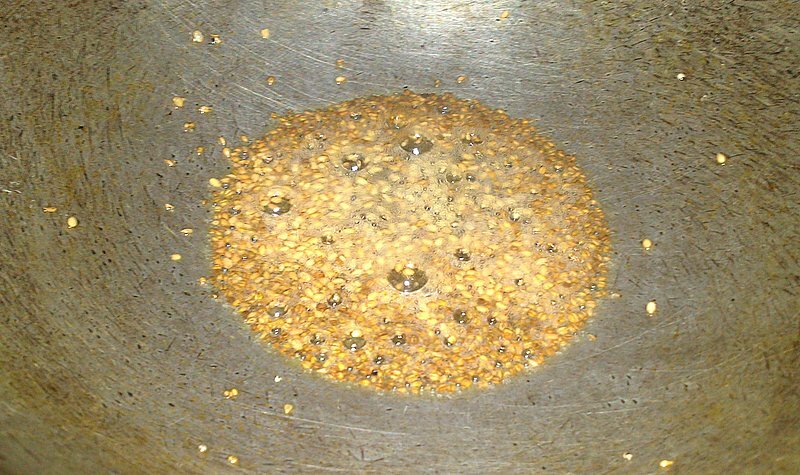 Once they crackle, add Sesame seeds, carom seeds and Hing. 5) Now, add your Hadvo batter to the pan. Cover it and let it cook on medium flame for 20 minutes or till the bottom is crispy and golden brown in colour. though keep in mind that for different types of pan time may vary. 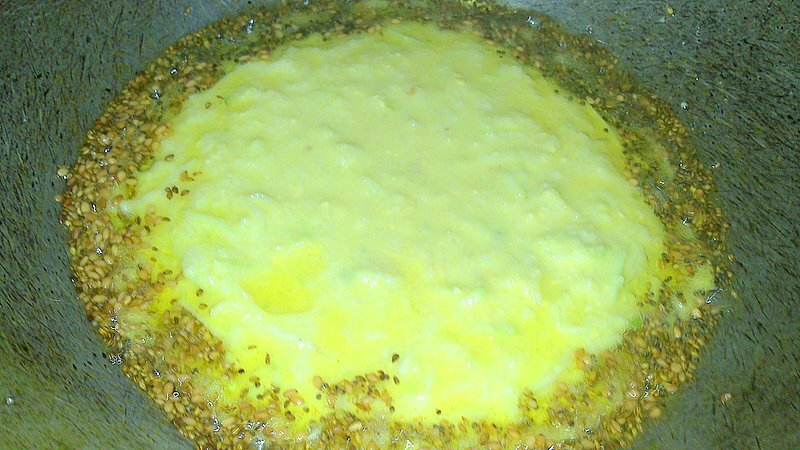 6) After this, flip the handvo and drizzle 1 tablespoon of oil on the edges. 7) Cook covered for another 15 minutes. 1) In place of making a single cake, you can make small cakes in smaller kadais (Pans). This way you can eliminate the need of non-stick pan. 2) You can also add other vegetables (like grated Onions, finely Methi, coarsely crushed peas/corn or grated carrots) in Haandvo, in that case reduce the amount of lauki.. Previous Post: Aalu Methi | Potato Fenugreek Curry – Simple yet yummy!!! Aah this is different way of making it. I am inlove with the readymade loth. Just so easy to fix and move on. Cheers. Hi, yummy and healthy with all the veggies. Thanks for sending it to "Healthy Me and Healthy Us event". I will definitely try this one next. Bookmarked! Mmmmm, mouth watering. I have a question. Do we have to use 3 cups of rice? Because, all the recipes I looked at said 1 cup rice for 1/4 cup dals. Do you use par-boiled rice?